Any new couple looking for personalized couple gifts will love this unique Embroidered Arrows and Heart Wedding Sherpa to snuggle under and remind them of their special day. Embroidered with Any custom message line, Any date, and your Choice of embroidery thread color our soft and cozy throw will make a practical keepsake for years to come. 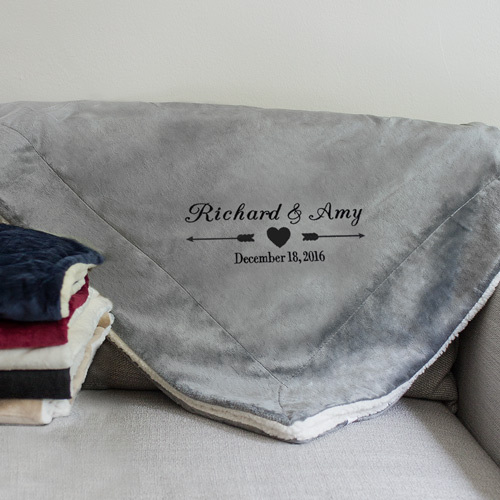 Our embroidered blankets are personalized gifts for couples to cherish for years after their big day. This will be a perfect wedding gift for my son and his soon-to-be wife. The blanket is soft and cozy and I love the embroidery. Can’t wait to give it to them! Wow! Gorgeous, soft and what a treasure. This is a wedding gift, so having a neutral color available - perfect. They will cherish! Very nice blanket. Soft and looks just like the pictures. Thank you!